Kolkata, Nov 21: After staving off defeat by a whisker, Sri Lanka skipper Dinesh Chandimal on Monday said the last 10-15 overs put his side under lot of pressure on day five of the first Test against India at the Eden Gardens here. 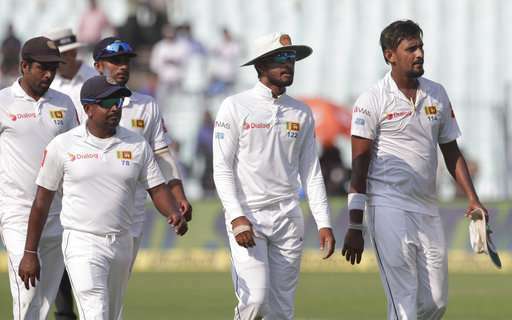 After dominating the first four days of the game, Sri Lanka were reeling on 75/7 in their second innings when bad light forced the umpires to bring the curtains down on the match. However, Chandimal also complimented his teammates for their good show. "We fought hard and competed well. Till the last session, we fought well and played as a team. "Unfortunately, the last 10-15 overs brought a lot of pressure but we played good cricket and competed well," he said after the match. The visiting captain said his team needed to learn how to battle in the second innings. "We'll have to learn how to battle, especially in the second inning s. In UAE also, we didn't bat well in the second innings against Pakistan. If we can do that, we can do a lot better." Chandimal had nice words for Lankan pacer Suranga Lakmal, who returned figures of 7/119 from the match. The 30 year old Matara-born bowler had impressive figures of 4/26 in the first innings, with his victims including Indian openers Lokesh Rahul and Shikhar Dhawan and skipper Virat Kohli. In India's second innings, Lakmal sent Rahul, Chetweshwar Pujara an d Ajinkya Rahane (0) packing. "Lakmal is unbelievable, especially over the last one or two years. He's one who you can trust as a captain," Chandimal said.